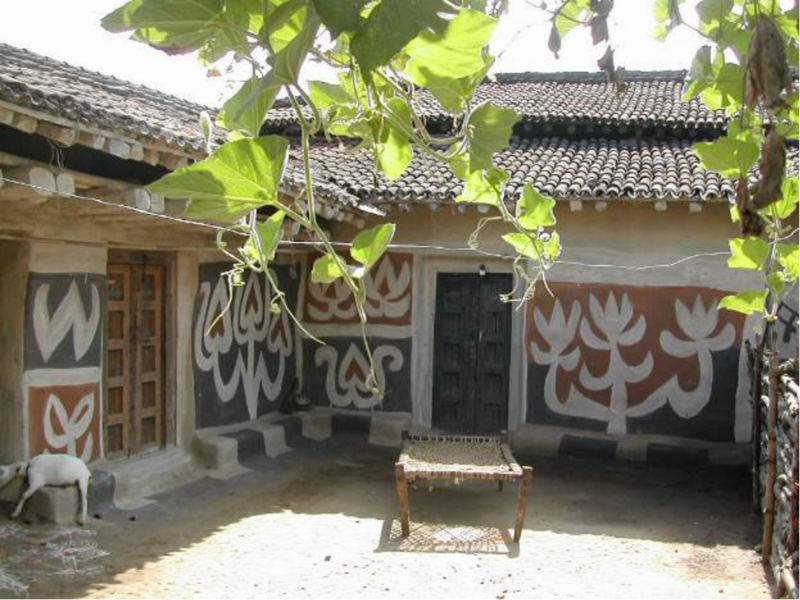 The wild and wonderful art of the hill country to the south of Hazaribagh overlooks from the southern extremity of the Hazaribagh Plateau, the North Karanpura valley as it is now called after an infamous coal mine project started there. This valley is in fact part of the continuation of the Vindhyan hill chain, forming a rift valley in an upper trap or basin, through which the Damodar river flows. The eastern flank divides the valley by a hill range called Sati Range. On this beautiful and isolated range stand a series of Ganju and Kurmi villages still secluded from the world below, and the harrowing life and experience of the coal mines that have, like leprosy, eaten into the beautiful forested hill country in which the tribals still live lives of secluded isolation and peace, and in which they can practice their country crafts and arts, the forms of the designs used in their paintings being illustrated in this article. Some of the forms are playful and naively drawn, thus painted with great felicity and imagination, and are an evidence of rich experience and vivid memory of these village artists of the wild forms of animal, bird and plant life, along with decorative motifs. 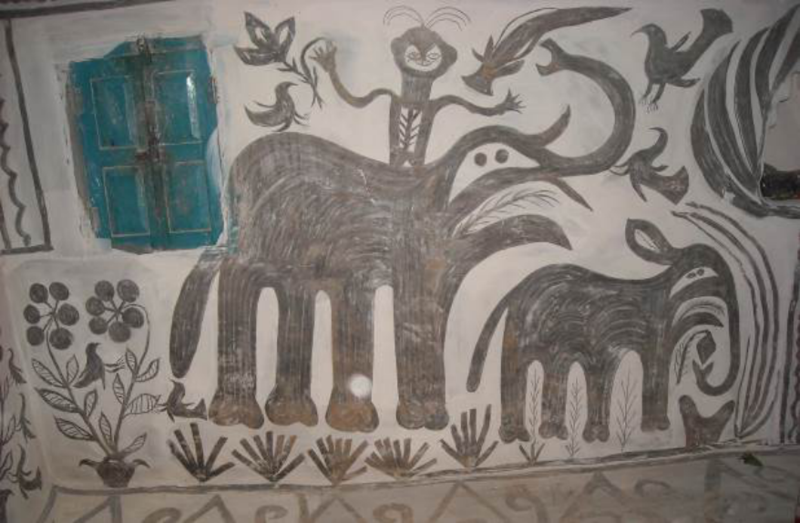 My name has now become inextricably linked with this form of folk art, which I first brought to public notice in 1992, and have since then considerably popularized both in India and abroad through a series of exhibitions and lectures. I have drawn attention between these forms painted in large murals on the village house walls, and the seals and painted pottery of the Indus Valley starting from the pre-Harappan level and thereafter continuing unchanged through the period of Harappan, and post-Harappan occupation, when it was finally brought to an end as an art form, although the pottery and ceramics on which it was painted continued into present times and may still be seen in the contemporary pottery of the Punjab in Ropar and Chandigarh, where it is found being sold in big stalls. 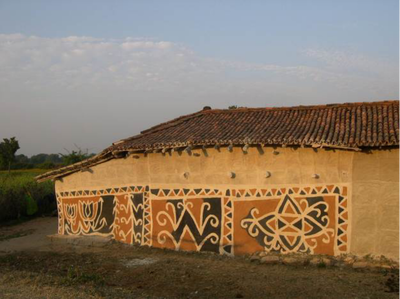 The same kind of pottery and painted forms have been found in the chalcolithic Jorwe, and Malwa cultures in Daimabad, Inamgaon, Prakash in the Deccan in the Narmada-Tapti valleys, which I will deal with later. It is of interest that similar forms appear in the prehistoric painted pottery of Iran: Susa, Nevahand, Slaik-II, Jemdet Nasr, Deh-bid (Fars), Tal-is-kav (Fars) Halaf. Figures 1 & 2: Kurmi Khovar. Jorakath Village. Figures 5 & 6: Sohrai by Putli Ganju. Saheda Village. We can say the “grid” pattern upon which some of the floral motifs of Iran appear (i.e. 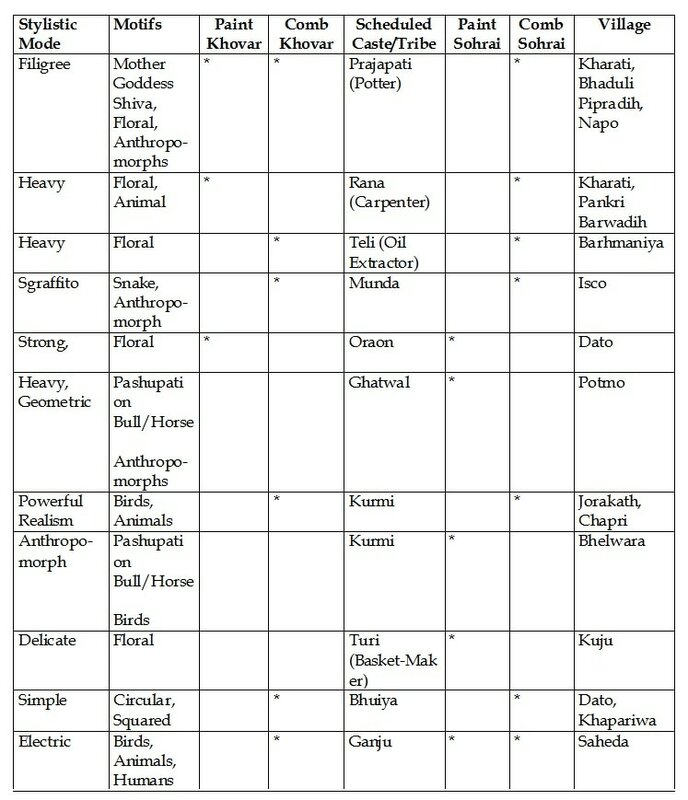 Halaf) are found in Harappan motifs too, and are a sign of the new “civilization” period when a new sense of urban and mechanistic order emerges. I would say that the Khovar and Sohrai wall painting tradition in Hazaribagh is in a pre-urban village phase and does not employ the developed “grid” formation, which is a sign of modern urbanization and which is the result of the destruction of the old village culture that marked the springtime of the human race. I would like to make it clear to the reader that Khovar and Sohrai are living artforms compared to the dead ones of Egypt, Crete, or Harappa. The most interesting aspect of the Hazaribagh animal and bird forms, and the most striking quality which they possess, is the relationships between the forms themselves and the relationships between the birds and animals with their young, a trait found in the Indus painted forms. This relationship is of a purely matriarchal nature, such as the deer and goats milk-feeding their young, or birds feeding their chicks with fishes and insects. There are interesting relationships between the animals themselves, such as a peacock or mongoose fighting with a snake, or snakes fighting among themselves, or the mother peacock with a young chick on the back, peacocks fighting, or a peahen breaking an egg. The knowledge of plant life is extensive as would be expected of jungle-dwellers. These murals are of a matriarchal tradition and the art painted on the houses is done by the village women and young girls, whom they apprentice in a handed down parampara tradition, when the young girls learn the artforms and fully convert them to memory. 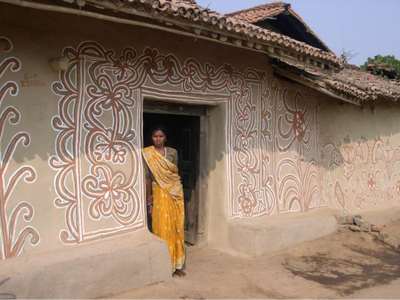 They take them when they get married to their husbands’ homes, which being in an Indian joint family, possess other art forms of their own. One can tell a range of stylistic differences in a village home, in which various sister-in-laws, and the old mother-in-law herself, have brought stylistic trends from another village to the home. The first artform group may be said to be of the tribal or autochthonous group. 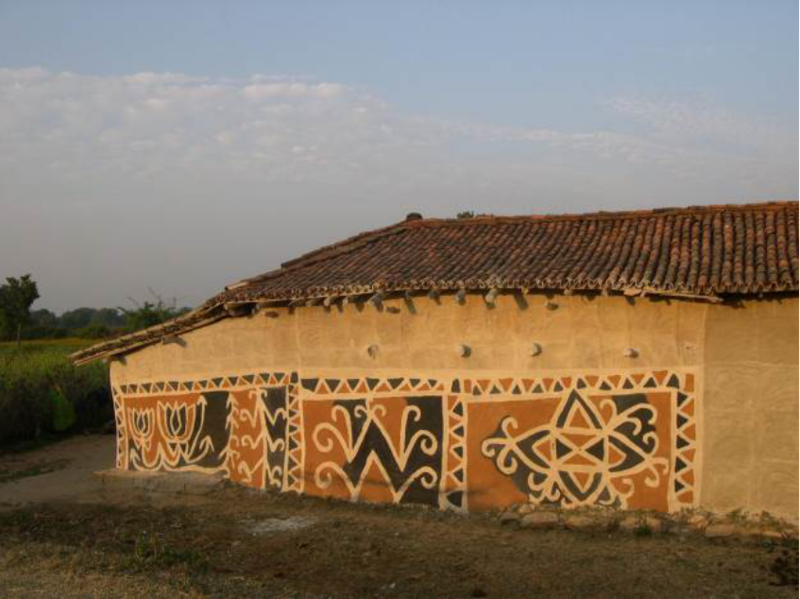 The second is artisnal group, the village’s overall stylistic genre. And thirdly, the individual artistic expressions of the artist herself. Apart from opening a very interesting discussion on the nature of the connections between Hazaribagh and the Indus Valley or the Deccan or other Central and Eastern cultures of India, the art opens a dialogue with the depiction of local belief traditions which find their illustration in local forms, for example the fabled “man-bird” or four legged bird “Chibba”, believed to live in these forests. 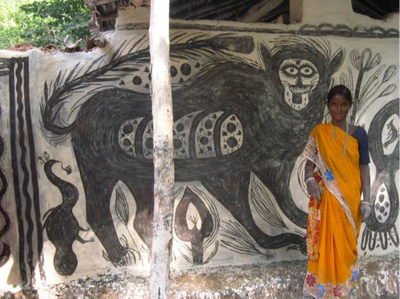 This denotes a purely local folk tradition which finds expression in the paintings. 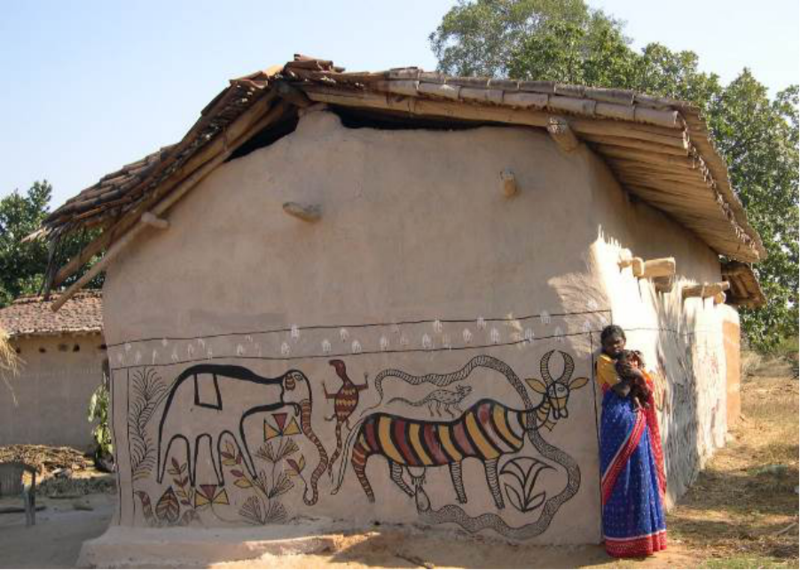 When we move from the animal and bird forms of the Kurmis and Ganjus in south Hazaribagh in villages like Jorakath, Chapri and Saheda, to the valley plains of Barkagaon and villages such as Kharati, Napo, Barhmaniya, and Bhaduli Pipradih, a noticeable stylistic change as well as observation in drawing of forms appears. Whereas the art of the hill villages shows an accurate observation of the wild animals and birds in the hill ranges, which are densely forested in natural forms, but as we move down into the Barkagaon valley, the village women draw much more prosaic, stylized, floral, and less vibrant animal and bird forms. The valley artists are more heavy in their handling of forms and line. The strong “living line” which we observed in the hill villages, is less apparent. However, we do sometimes find the converse true when women from the hill villages marry and come down to the plains, and vice versa. That the women living in the forest environment should draw and paint wild animals and birds in a lively way is of course quite natural. 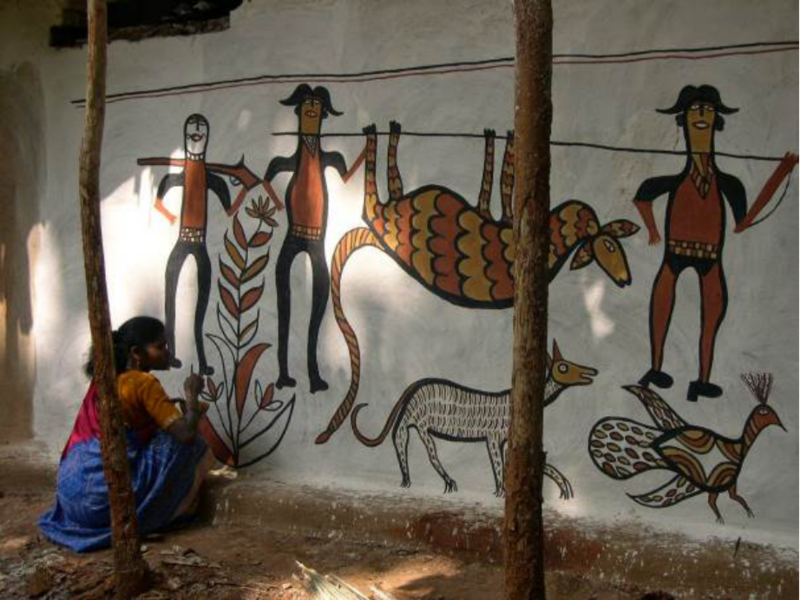 It may also be noted that the Kurmi women of the hill villages paint zoomorphic and anthropomorphic forms depicting the first god (Siva) in much of their art, which shows a sacred significance. The closest forms to the rockart of Hazaribagh is drawn by the Harijans, the Bhuiyas, and the nomadic Birhor tribe, who claim that it were their ancestors who painted the rockart. Figures 7 & 8: Prajapati Khovar. Barkagaon Valley. Figures 9 & 10: Prajapati Khovar. Barkagaon Valley. The village women take great pride in their art, which is a part of their regular repair and decoration of their homes, and an inspirational occupation and ritual sacred tradition. 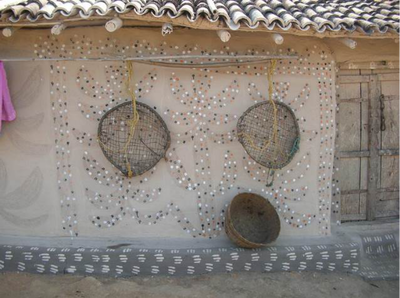 These forms are evolved from a long process of evolution in which mystery and imagination have been working in the minds of simple village women since time immemorial, and they have to be considered as a national heritage. Unfortunately, the entire region has been the subject of the most vicious kind of destructive development for the past five decades and more, and more villages are threatened with even more destruction to make way for the opencast coal mines, thermal power stations, and other industrial undertakings. 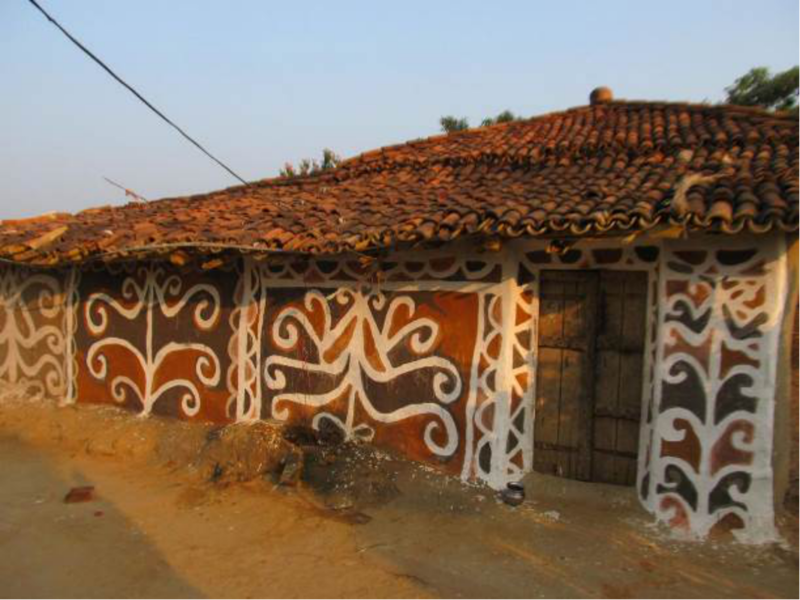 In even those villages which are not being immediately destroyed, the money the coal mines bring into the area, with a new lifestyle, are causing the mud homes with their handmade tiled roofs to be replaced by cement ones with their concrete roofs. Mud plaster has been replaced by cement and the need for annual repair which occasions the paintings primarily, is gone. 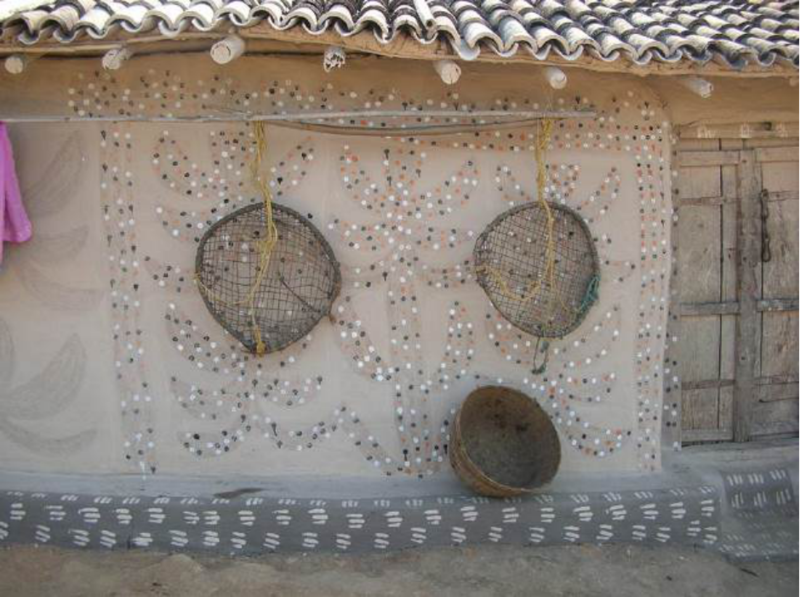 The ceremonial nature of the art is seen during the marriage season which is in the summer, when the houses are repainted, especially in the marriage room or Khovar, a tradition that is slowly dying out in the new cement houses. 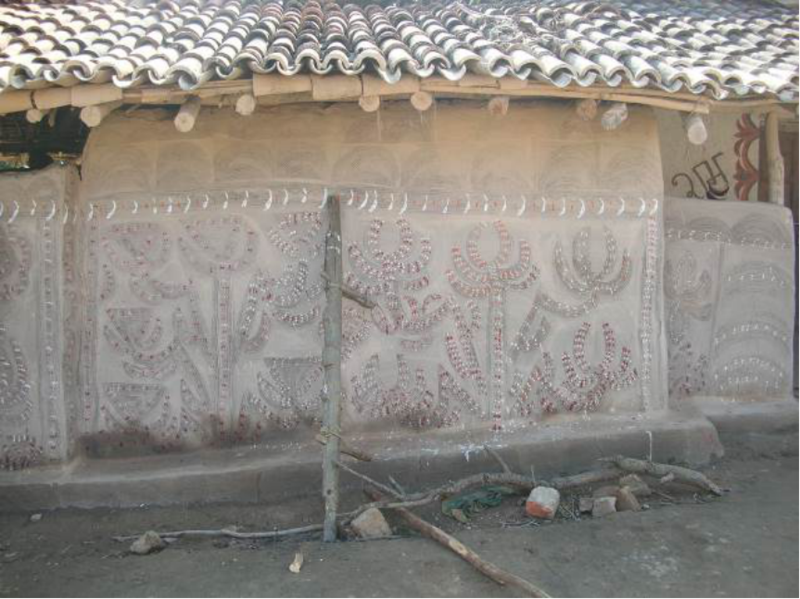 Even the painted murals of Sohrai done on the walls during the harvest season with the onset of winter is dying out with the coming of the cement culture. This is called development. The religion of the villagers is a vernacular animist worship in which the animals play the role of simple objects of respect. For example the elephant and tiger are deities of the forest, and the forest god depicted as a tree is Siva. With the onset of modernization and sanskritization, this old group of significance dies out and new forms appear including forms of Hindu gods and goddesses, and the objects portrayed in the school drawing books such as roses, vases, fruit forms and other such trivia drawn according to western art rules based upon realistic portrayal, in prescribed artistic forms. There is an urgent need to move away from the artificial mechanical drawing and painting first brought to India over a century and a half ago on the lines of which arts and crafts are presently being taught in all Indian schools. 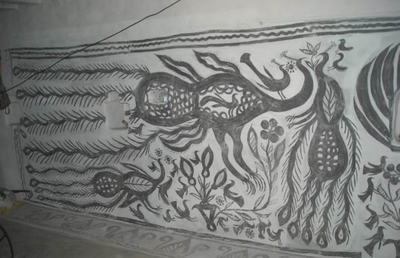 The need of the hour is to return to the natural two dimensional perspective of traditional Indian pata painting, such as Khovar and Sohrai and the earlier Kali Ghat pata tradition using the indigenous materials such as natural earth and stone colours, lamp black, etc. When we study the art of the Indus and Central-Eastern India one thing gets abundantly clear, and this is the excellence of the individual motifs. This means that over long years of experience and training in the very best forms timeless motifs have emerged which could speak for that civilization to unborn generations many thousands of years away. Great art is the symbol of a great culture. Our present culture in modern India has no greatness of artistic expression to leave to unborn generations apart from the artistic traditions which we have inherited from the past, and which continue as living traditions among the depressed classes. Artistic heritage has to be recreated from generation to generation. It is a living expression, not a dead one. 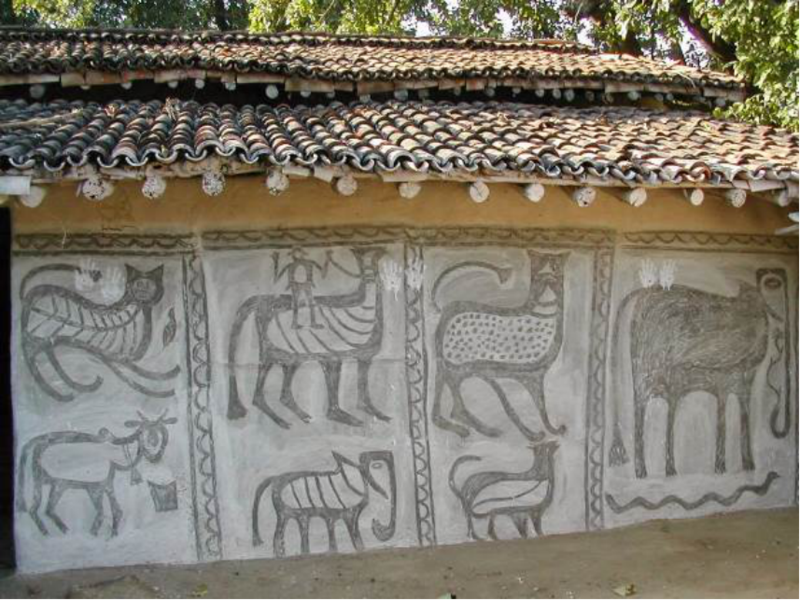 I propose that the art of Hazaribagh and its forested environs is set to represent to future generations the greatness of our civilizational status. 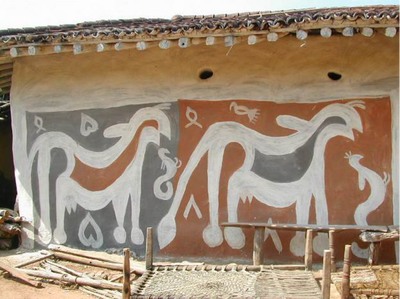 The painted pottery of the Indus Valley is a repetition of motifs of uniform excellence. Each individual motif is an extremely powerful statement for the civilization, culture, and historical eminence of the people who made it. The initial forms were pre-Harappan. The icons of our contemporary culture of today are unfortunately of mechanical and scientific rather than artistic nature, and are hand-downs from the West. 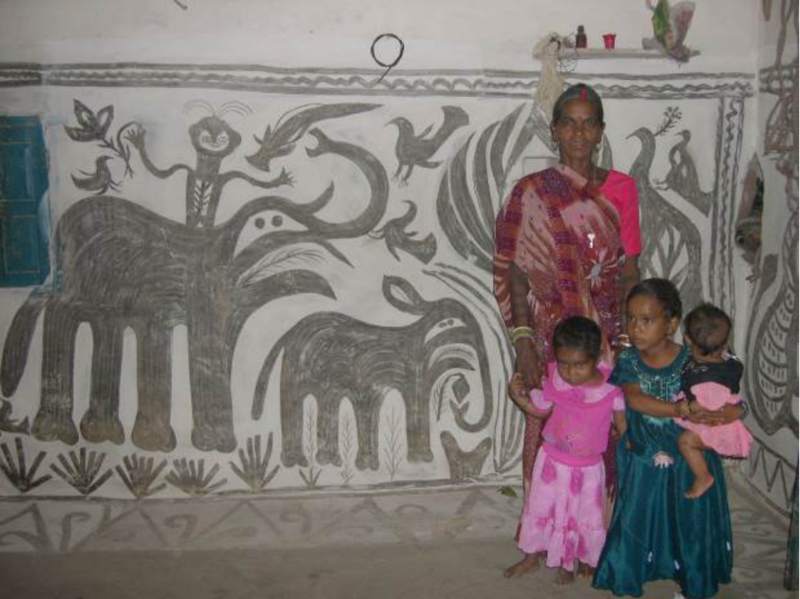 The quality of art forms in the villages of Hazaribagh are of such a high quality that they could fire the imagination of Picasso, Matisse or Braque. Their force is in a unique visceral quality of abstraction and expressionism at its best. These forms inspired the art of Jamini Roy, Nandlal Bose, Ramkinkar, and Binode Behari Mukherjee. Figures 11 & 12: Kurmi Khovar. Jorakath Village. I have divided the art into two forms Khovar (sgraffito) and Sohrai (painted), and further classified it under eleven Stylistic Modes. 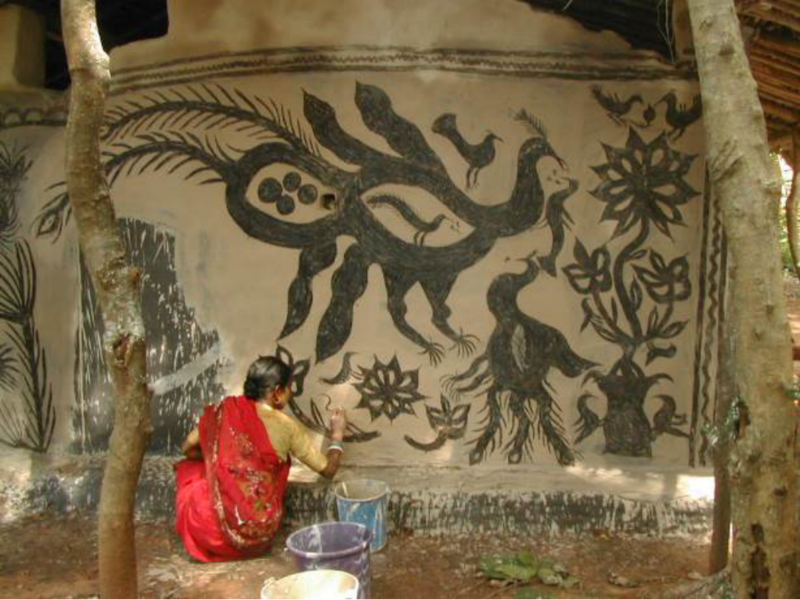 The painted form of mural done with earth colours I have called Sohrai for its prominent use of colours as a visual expression, practiced during the harvest festival of Sohrai with the onset of winter. It is also painted during the marriage season. Its main practitioners are the Kurmis of east Hazaribagh, the Ghatwals of the same region, the Ganjus of South Hazaribagh, and the Oraons of West Hazaribagh. 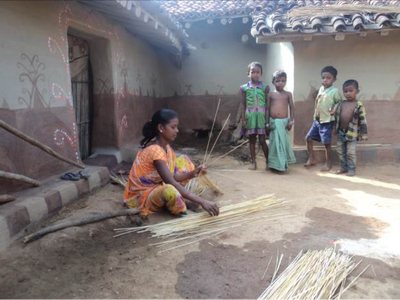 The women use chewed toothsticks (datwan) instead of brushes. 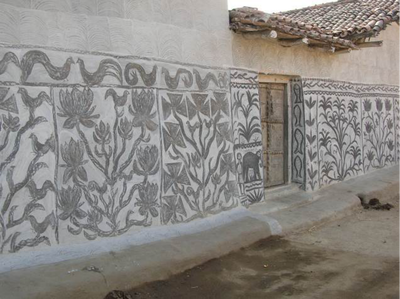 They make a liquid pigment of three or four shades (red, white, black, yellow) in which they dip the Kuchi or datwan and make the painting, applying the liquid earth colours directly on the clay walls which immediately soak up the paint like a sponge, and sometimes cloth pieces are dipped in the colour as a brush. These are indigenous techniques. They do not mix up any binding agents such as lac, acacia glue, or rice water (marh). For this reason, after a heavy shower of rain, sometimes the painting itself washes off. 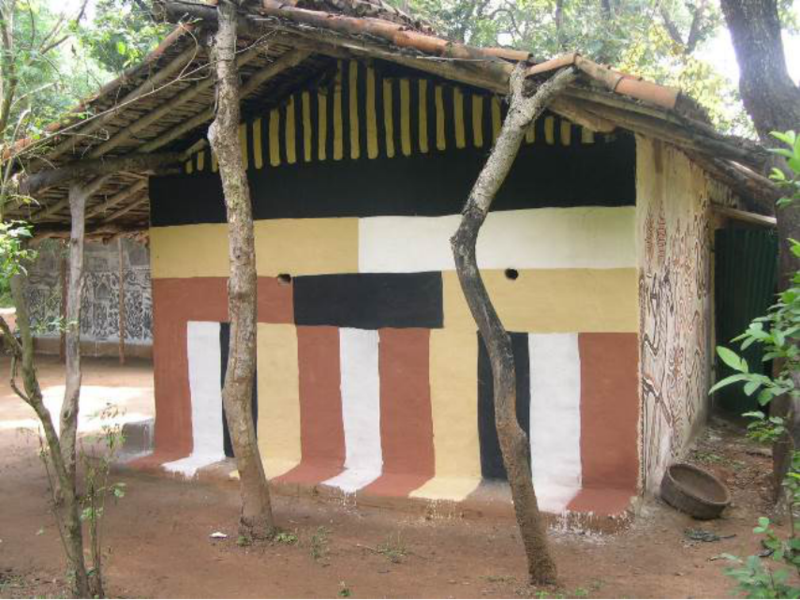 The white is plain kaolin; yellow is a natural earth ochre; the black is a kind of manganese earth; the red is the natural red earth colour, or ground haematite stone (where it is found), the latter being popular among the Ganjus. All the colours are found close to the village except the white, which is dug out of a tunnel in the earth wherever it is found, and frequently a tunnel collapses and is the cause of deaths when women are crushed under the fallen cave ceiling. These sites are called Chuna-Khaan, Chuna being the local name for white lime, and Khaan being a mine. The black manganese earth is dug up around the edges of fields bordering the jungles. The yellow earth is a common earth called Nagri used by potters, and it is also commonly used for washing the hair by the village women. 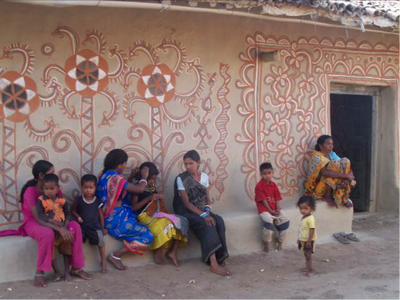 The red earth is Gerua which is very common and sometimes is found in a beautiful pink shade or lavender. The deep purplish red colour which also appears in the paintings of Ganju women is haematite, which is made by grinding the stone of the same colour with water. This then is the simple palette of the Hazaribagh village women artist. I am sure that the houses in the villages and the towns of the Indus were similarly painted, proof of which comes to us from the painted pottery. The same can be said about the chalcolithic farming cultures of Central India and the Deccan. 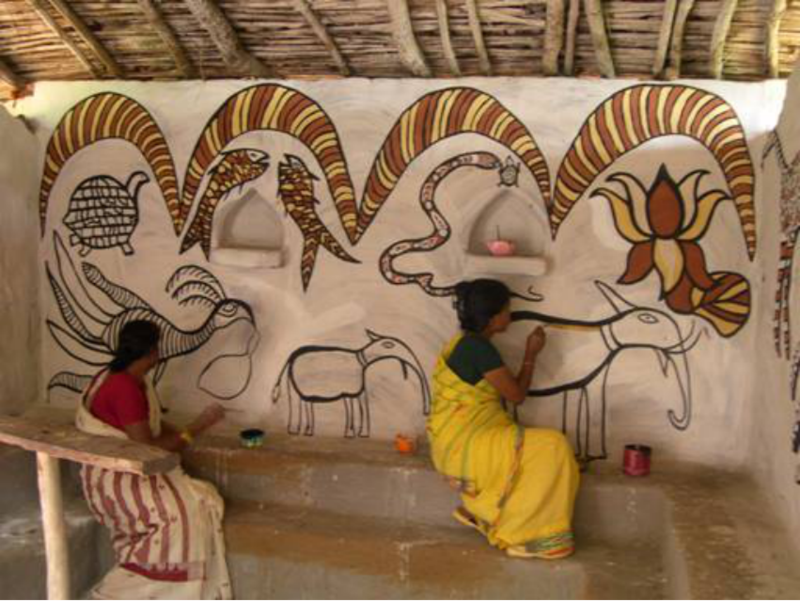 Hazaribagh also has a rich pottery painting and comb decorating tradition which is practiced especially during the marriage season on the ceremonial pots (Kalsa) which hold water and mango leaves for blessing. Figures 13 & 14: Kurmi Sohrai. Bhelwara Village. 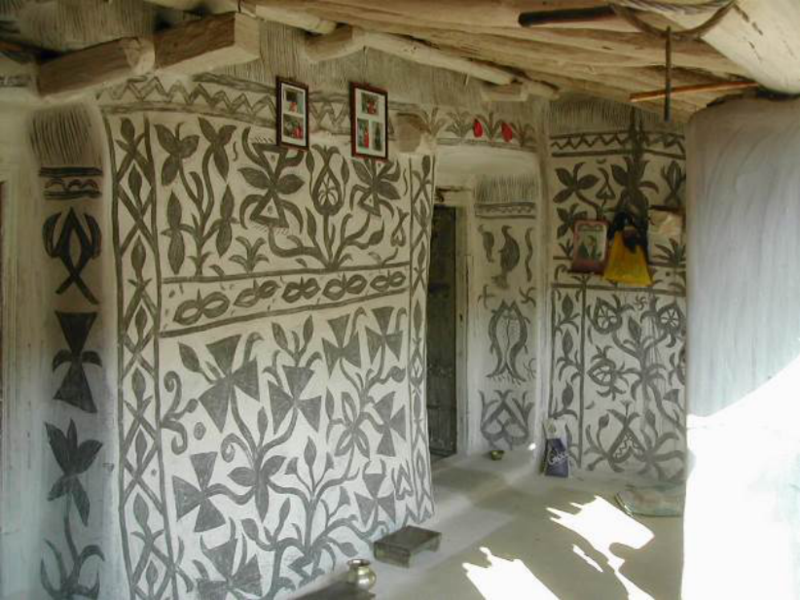 The next form of mural technique is in sgraffito, in which a coat of white or yellow earth is applied over the black manganese ground, and before it has fully dried is scratched or scrapped with a comb so the black undercoat is revealed in the form scraped away creating a brilliant and powerful motif. 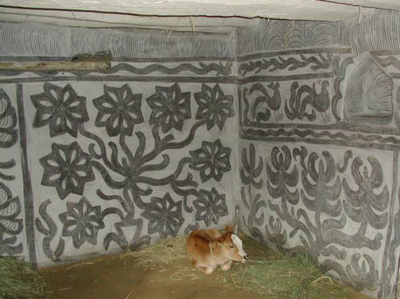 Those who have read my books Bridal Caves and Painted Houses of Hazaribagh will find detailed information about the art in its ritual context there so I will not dwell on it too much here. 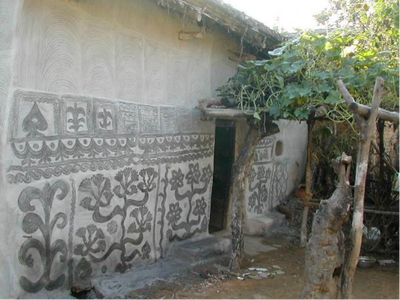 This comb-cut art I have designated Khovar as it is widely used among all the different artisnal castes and tribal groups for the decoration of the marriage house and the bridal room, which is called Khovar (Kho= cave; var= bridal couple). 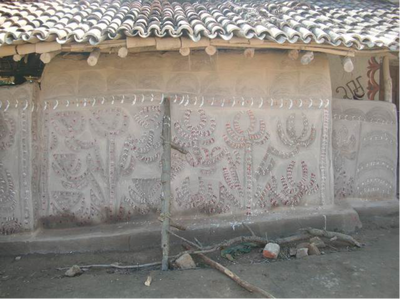 The comb cutting art is also used by artisnal societies for decorating their houses during the harvest season (Sohrai) but they are then decorated with red (vermillion) and white (rice) spotting with liquids either stamped or sprayed on the walls. Basically the paintings are made during two seasons, once with the onset of winter when the harvest festival of Sohrai takes place, and again during the marriage season of Khovar with the onset of spring and summer. 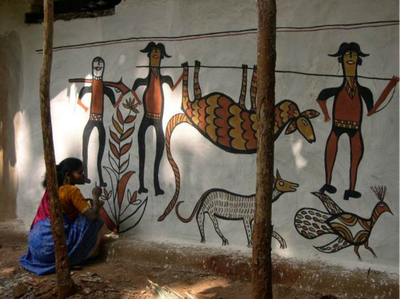 Figures 19 & 20: Munda Wall Painting. Isko (Isco) Village. Figures 21 & 22: Oraon Sohrai. 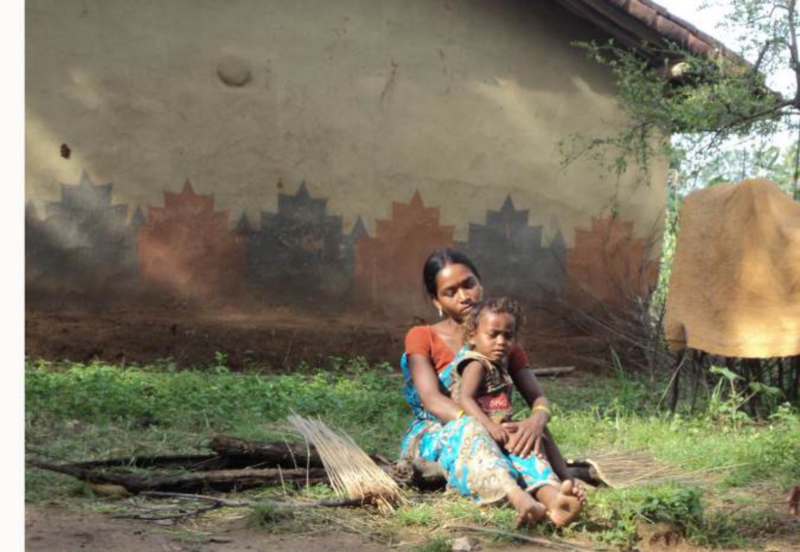 Figures 23 & 23: Santhal Sohrai. Jarwadih Village. One of the most compelling things about Khovar and Sohrai murals is their initial appearance of being full of ornamentation, but this is soon dispelled when one realizes that the objects themselves are quite simple, and that the appearance of ornamentation arises from the filling of every available space with some form or another, and that is why from a distance the entire space seems covered with artforms, and hence gives the appearance of ornamentation. Due to lack of ornamentation the individual forms are hence purer and more powerful, and the overall impression conveyed by the heavily painted space is one of power and vivid imaginative display, which are the two most significant achievements of the art. By comparison the petty pretty forms taught in the art classes of our schools presently in imitation of the western mechanical artistic trends is unauthentic when compared to the indigenous Indian tradition. Reprinted with permission from Bulu Imam. 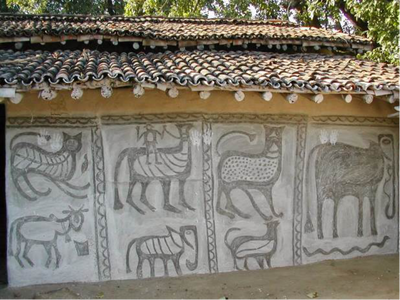 The Art of the Hazaribagh Hill Villages first appeared in Polycarp Journals (now out of print).